With movie and television studios and other forms of multi-media becoming more of a force at comic book shows across the country, it appears that comic book dealers and comic books themselves are having less a presence. 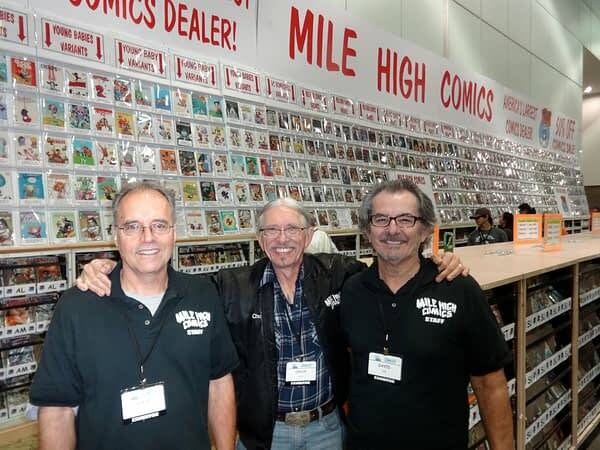 Chuck Rozanski is the president and CEO of Mile High Comics in Denver, Colorado, the largest comic book store in the country. Over the years Rozanski has appeared at numerous comic cons including San Diego. In the following interview, Rozanski addressed some comics-related topics during Stan Lee’s Comikaze Expo held in Los Angeles. Jason Strangis: In the past decade it seems as though comic book dealers aren’t as visible or prevalent at major comic cons. Why is that? Chuck Rozanski: Cost per square foot. The amount of comics you have to bring these days is up to about 100,000 and you cannot get that many comics in a cost-effective way into convention booths these days. So everybody tends to specialize, but that ends up being rather unsatisfying to most consumers. JS: The San Diego Comic-Con in particular has become more about movies and TV shows and less about comic book dealers. CR: We’ve been going to San Diego for 43 years straight. It’s now a lottery to get tickets to San Diego. That means that longtime comic buyers cannot get in. The people who are going to San Diego do it because it’s a cultural phenomenon and it gets them social status… That has absolutely nothing to do with buying comics. JS: What are some of your favorite shows? CR: The best comic book shows in the country are Minneapolis, North Carolina, and Baltimore. Those are all great comic shows. JS: In general, what is the overall status of comic book stores around the country? CR: Comic book stores have been growing a little bit over the last few years. The movies have been helping a great deal. The actual number of retailers is up for the first time in a couple of decades. It’s a healthy business at this point. JS: How has your store, Mile High Comics, been doing lately? CR: Our store is kicking a–! Jason Strangis is a freelance writer and longtime comic book collector currently based in Los Angeles. He loves attending comic book conventions, especially the larger ones such as San Diego, Chicago, and now Comikaze in L.A. You can reach him at jwstrangis@gmail.com.